Pour les laboratoires de controle et de recherche. For the first time, the new NRS-4100 brings together a number of critical elements to make Raman spectroscopy accessible not only to experienced spectroscopists, but also to first-time users. The first thing you will notice is a Class 1 safety cabinet more commonly associated with high-end Raman systems, but that is only the beginning. Once you operate the interlock switch the door opens to reveal a wealth of powerful tools. 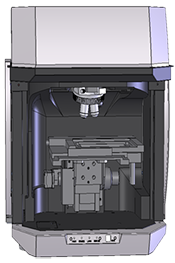 The purposed designed microscope is completely rigid to prevent flexing, this is not the case with other systems built around an optical microscope. The NRS-4100 also offers observation of the laser spot (not generally available) to ensure it is perfectly aligned to the target sample and with X/Y spatial resolution to 1 µm (Z=1.5 µm). Switching between observation and measurement modes is completely automatic and can be done with the safety cabinet closed. Standard Configuration with 532/785nm lasers with matching notch or edge filters The NRS-4100 offers standard configurations that include the typical 532/785nm laser combination with matching edge or notch filters and an option for a third laser. All laser wavelengths are automatically selected in the software and, once selected, the optical system including the laser is automatically aligned for optimal throughput and resolution. Four software selectable gratings control the spectral range and resolution from 8000 to 100 cm-1 as standard (8000 to 50 cm-1 as an option). With a direct-drive rotary encoder, the wavelength reproducibility is ±0.2cm-1 New 457 nm laser for fluorescence rejection and patented fluorescence rejection algorithm JASCO has developed new and novel (patented) mechanisms to deal with sample fluorescence. 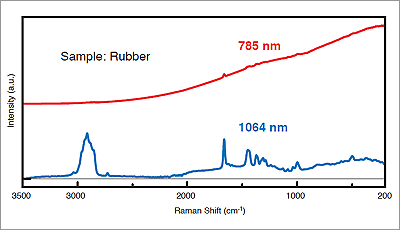 As with other Raman systems, we can utilize laser wavelengths of 785 nm and up to 1064 nm, but we have recently incorporated a 457 nm laser option that offers higher Raman signal, improved spatial resolution and much lower fluorescence for many different sample types. 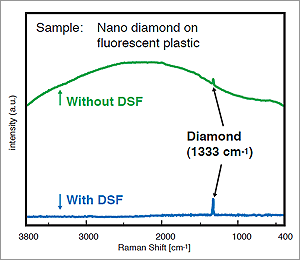 Selecting optional excitation laser wavelengths is only one of the ways JASCO minimizes fluorescence interference. The Fluorescence Rejection algorithm (patented) included in the Spectra Manager II collection and analysis software effectively removes or minimizes fluorescence regardless of the laser wavelength used. With a choice of refractive objectives, both micro and macro measurements are possible as well as options for long working distance objectives for heated sample stages and other sampling accessories. 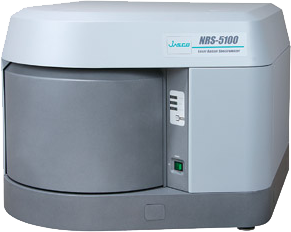 The NRS-4100 can also be specified with a manual sample stage or the PC-controlled, automated XYZ mapping stage in addition to a modified stage (80 mm working distance) to accommodate a variety of heating and cooling sample accessories. The ‘UserAssist’ software aids the user in setting up the NRS-4100 for sample measurement; a simple sequence guide takes you through setup and optimization of measurement parameters with helpful advice and tips, such as a warning if you have the laser intensity set too high. When each of the parameters has been set, the NRS-4100 automatically selects the laser and matching notch filter, the grating for the appropriate resolution, focuses on the sample and then the spectral measurement is performed. The new ‘Simple Search’ function is used with the automated XYZ stage. A new algorithm developed by JASCO (patent pending) analyzes the microscopic image and automatically selects measurement position(s) based on the size, contrast and/or color of the target material. The user simply clicks the measurement button to execute spectral measurements of the desired sample positions. To provide faster Raman image processing, the Imaging Analysis software includes a ‘Registry’ of possible functional groups or other relevant compound information based on peak height or area calculations. After a peak height or area calculation is developed, it can be saved to the Registry for future analysis use. The registry includes the peak calculation information and a ‘label’ describing the relevant vibrational motion. Image maps can be developed from mapping data simply by clicking on the desired, registered calculation to obtain a false color image of the peak intensity data for the registered calculation. The performance and functions expected on a micro-Raman spectrometer are all provided with the NRS-5000/7000 series Raman systems, assuring consistent performance for rapid acquisition of high quality data with automated systemcontrol and minimal optical adjustments. Unique DFS function provides higher spatial resolution than normal confocal optics to irradiate only the target sample. SPRIntS imaging is a laser scanning function which supports high speed measurements by scanning the laser excitation beam using individual scan mirrors (VertiScan) to irradiate the sample while collecting data from a high-speed CCD detector at a minimum of every 5 milliseconds. The VertiScan function also supports a 3-D imaging function by utilizing the Z-autostage and the confocal capability of the instrument system. The VertiScan system is unlike other laser scanning functions because the sample is illuminated with a vertical laser beam every time to retain measurement confocality and obtain a high quality, undistorted Raman image. Pour l’analyse directe et non destructive sur des echantillons immobiles ou non prelevable. Although the RMP-510 is described as a portable Raman spectrometer, this is largely due to its robust optical design and tolerance to being transported. In fact the optical performance is close to that of a conventional bench top Raman system and offers many of the same features like interchangeable grating monochromators for a range of spectral resolutions. Spectra Manager Software simplifies data collection and analysis. Sadtler KnowItAll ™ software is included for library searching and sample database creation. Installation and training are included. 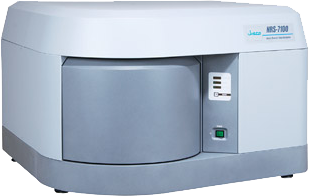 The RMP-510 is designed to provide laboratory quality data in a portable system. A small, portable, high-resolution Raman instrument. Validation software is included with the system. Fiber Optic interface allows for remote and reaction monitoring. Manual stage with camera for microscopic evaluation. 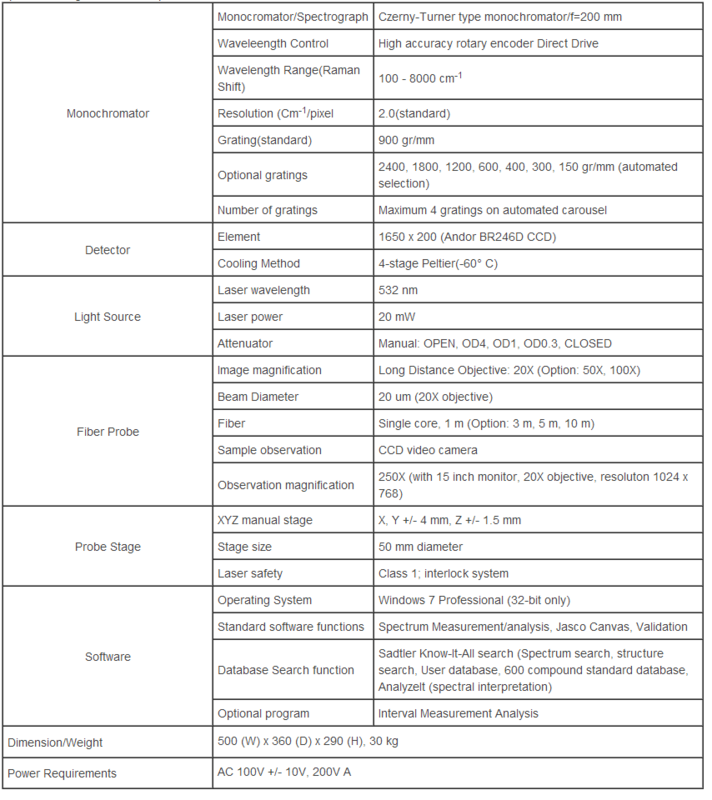 Spectra Manager II software operation included. 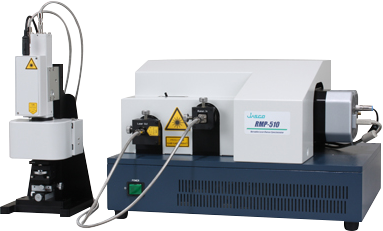 The RMP-510 can be used for non-destructive measurement of large and immobile samples with extremely high accuracy and resolution, for example: artworks, contamination in auto engines, reaction monitoring in vessels, etc. 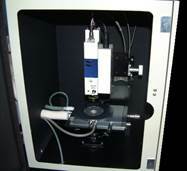 By combining both IR and Raman measurement into one system it is possible to make simultaneous measurements without moving the sample; this is particularly useful for samples that require significant preparation or take time to mount on the sample stage (for example, when using a diamond anvil cell etc.). The Raman laser light is routed through the FTIR microscope objective to make the simultaneous measurement. Spectral data can be combined in Spectra Manager II for 2D correlation analysis.